C. Hosidius C.f. Geta was one of the moneyers for the year 68 BC. 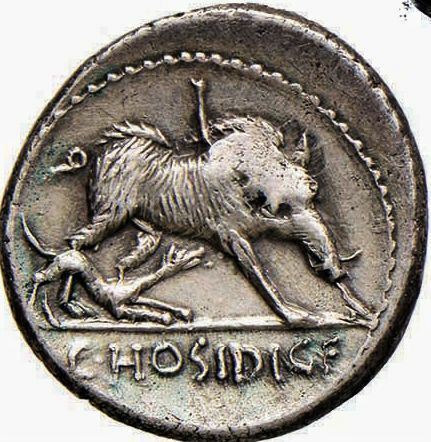 He is likely identical to the Hosidius Geta who was proscibed in 43 BC, as a part of the backlash for the murder of Julius Caesar. He was rescued by his son who pretended that the elder Geta had taken his own life, and performed the funeral rites while concealing his father on one of his farms. The father disguised himself by wearing a bandage over one eye; but when he was pardoned, he found that he could no longer see with that eye.